The cecal worm (Heterakis gallinarum) is a type of internal parasite that infest the ceca. They are extremely common and thrive on the ground or litter of overcrowded bird enclosures. Cecal worms have a direct life cycle. 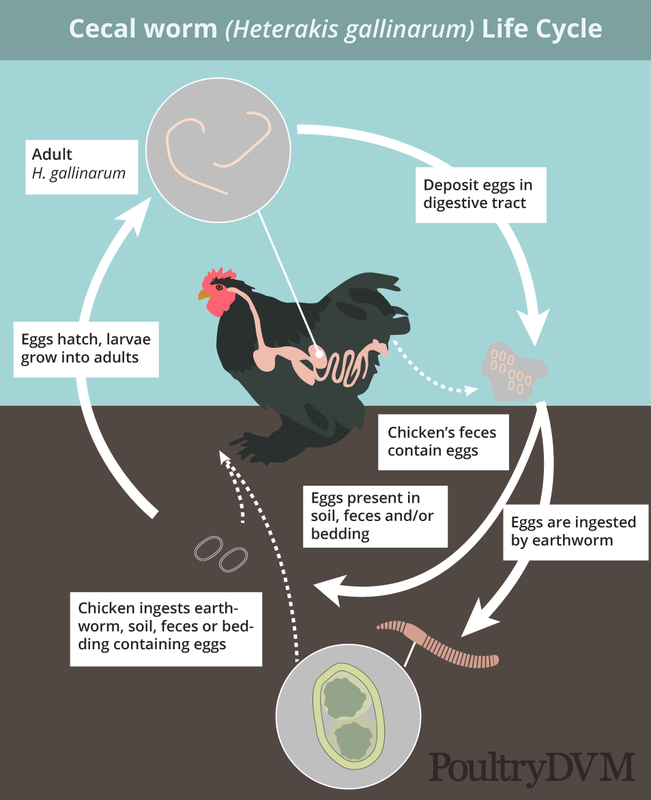 Adult worms produce eggs while inside their host (the infected chicken), which it passes within its feces. The eggs remain in the soil or litter for several weeks or are ingested by another chicken. Once inside the chicken, the larvae hatch in the upper intestine and relocate to the ceca. Eggs are also ingested by earthworms, which are then consumed by the chicken, who becomes infected through the earthworm. The main importance of the cecal worm is that it serves as a main vector for the transmission of Histomonas meleagridis, a protozoan parasite known to cause blackhead disease. Blackhead disease is of most significance to turkeys, but can sometimes affect chickens. Chickens are often carriers of H. meleagridis, and show no clinical signs but regularly shed its eggs in their feces. This is why it's important that chickens and turkeys are not raised together. It is also important not to raise turkey in the same area that was previously used to raise chickens, since H. meleagridis can survive for up to two years in its environment. Cecal worms are transmitted to chickens through eating intermediate hosts (earthworms), or directly through contaminated water, feed, bedding, or soil. Ivermectin (drench or injectable) Administered orally - 1/4 cc (mL) per large breed chicken, 6-7 drops (0.1 cc) per bantam. Levamisole (drench) Administered orally - 1/4 cc (mL)/lb body weight.